Currently, the market is citing monolithic gains, the kind not seen in over a year. The top 10 are reporting daily increases approximating an average of 17%. It’s often suggested that a rise in Bitcoin correlates with a spike in altcoins, and historically, this has come to fruition with alt season often succeeding a successful BTC rally. 1. Print out every Binance altcoin ticker. 2. Cut out each ticker individually. 3. Attach each ticker to a dart board. 4. Throw dart at dartboard. 5. Buy the altcoin that the dart pierces. While high throughput is an attribute that many cryptocurrencies wish to attain, Quarkchain takes this to another level, aiming to deliver over 1 million transactions per second (TPS). The reason Quarkchain makes our coveted list is the imminent launch of its mainnet, Singularity, which goes live on the 30th of April. See you on April 30th! After undergoing a year of stress testing, design and development, Singularity is nearly ready to launch, and promises to finish what Ethereum 2.0 plans to achieve “ahead of time;” by becoming the worlds first blockchain project to fully integrate state sharding technology. Read more: Vitalik Buterin admits Ethereum is losing its lead "to some extent"
The mainnet will launch with a number of novel features, including the aforementioned state sharding support, which effectively allows the ledger to be stored on different partitions, which can be aggregated together to form an entire network. Keeping data separated into these various partitions produces higher efficiency, and headroom for storage, producing a highly effective scaling solution. Qaukchain Also boasts a bespoke consensus algorithm known as Boson consensus. However, this isn’t a single consensus algorithm but rather a class of consensus algorithms, which can enable different consensus and playback algorithms on different shards; with hash power subsequently being adjusted and fairly distributed across the multiple shards. This technique manages to foster higher scalability and ensures decentralization and security. As for QKC itself, the token will work as a fee or a “gas” for transactions, much the same as Ether works for transactions on the Ethereum network; the token will also be used within newly added shards, which require a stake of QKC. 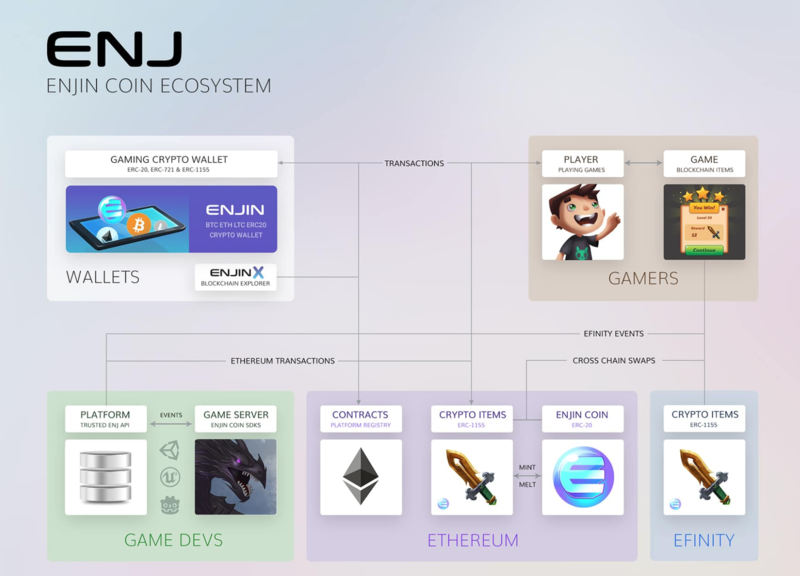 With sights set to create the largest online gaming community platforms, Enjin along with their native cryptocurrency, Enjin coin (ENJ), have curated a platform designed for the creation of blockchain based games; allowing users to create and manage games without the convolution typically associated with working with blockchain architecture and code. Read more: Enjin partnership with Samsung confirmed? This multiverse is an “expanding universe of connected blockchain games” within which fungible and non-fungible items, known as ‘Multiverse items’, exist in multiple forms, across multiple games, and are shared by a plethora of players; all in the form of an ERC-1155 token. Keeping the idea of connectivity firmly in mind, Enjin has joined forces with AlterVerse, a gaming and world building ecosystem, in which users can play and create an infinite number of interconnected games. AlterVerse will integrate Enjin into their platform, utilizing ENJ development tools to augment blockchain technology into their games. Enjin’s Multiverse items will also be integrated, allowing players to use these items throughout a number of different titles. ENJ comes into play (pun intended) within the creation and management of these virtual items, enabling users to trade these assets with each other, buy them, sell them and even create them. Join @enjin on April 4th at 1PM UTC for an AMA in the #Binance English Telegram group. There will be over 1,000+ $ENJ backed ERC-155 tokens of varying value to giveaway! The native cryptocurrency of the world famous Binance exchange, encompasses ever-growing utility, however, for the most part, it's been used as a fee for transactions upon the exchange. Now, with the rise of Binance launchpad, BNB is fast becoming a prime conduit for investment. While no actual technological developments are schooled for Binance this month, Launchpad will be undergoing its 4th token sale, however, this time under the newly established ‘lottery’ format. This change was initiated in order to make even the playing field, as past Launchpad session had been condemned due to the first come first served nature in which the sales had been conducted. So why does this make BNB a coin to watch? The format furthers the utility of BNB by increasing the benefits of holding the coin for an extended period of time. 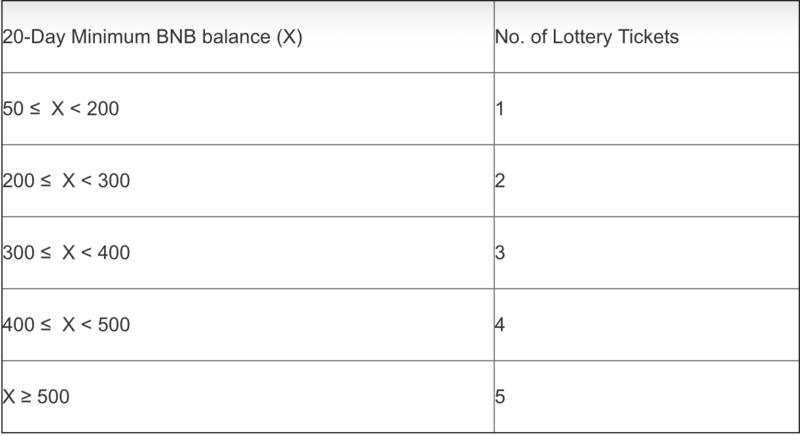 The number of “lottery” tickets available to claim, depends directly on the amount of BNB held in the 20 days before the day of the draw. The amount of BNB held correlates to the number of tickets available to claim, for example, a user with 50 to 199 BNB held over a 20-day period will be eligible for 1 lottery ticket. Every day at 0:00 AM (UTC) a snapshot of user funds will be taken to ensure that holders have both the required amount of BNB… No sneaky business. Historically leading up to a Launchpad session BNB has increased in value. This is mainly due to buyers accumulating BNB in preparation for the token sale. One instance of this happened prior to the BTT token sale back in late January. With this new value proposition emanating from the incentive to hold a large amount of BNB for an extended period, it will be interesting to see how this changes. Next to that Binance CEO Changpeng Zhao announced on April 4 that the Binance DEX mainnet will launch this month AND a new fiat-crypto exchange in Singapore will start in the next 4 weeks as well. A big April is coming for Binance. That concludes our coins to watch for March, join Chepicap next month for more cryptocurrencies to keep tabs on! This is not investment advice, price doesn’t always react to developments - this is simply an overview of coins that could be in the spotlight the next month. Which coin are you backing?